Be Kind to Me, Social Media! This week I’ve been trying to get up to speed with social media. As a marketing consultant, and for obvious reasons, I need to know a lot more than the typical social media user. I think I probably already do…but the more I learn, the more I realize how much more I need to learn. The social media landscape changes almost daily and there’s a lot to keep up with. What’s great is that the communities are trying to make their tools easier to use and more accessible to the hoards of people signing on to enjoy them. That’s why I hold out hope that “social media” will be kind to me, that “they” will keep giving me the support I need to become aptly proficient. By the time my daughter signs on (oh gosh, I hope that’s in a loooong time! ), I’ll know more than enough to be able to guide her experiences responsibly. But that’s another topic altogether. I’ve been tooling around a little more than usual in Facebook, Twitter, and LinkedIn (what I like to call the Big Three), but I’ve also been practicing my skills in YouTube and Hootsuite. We’ll see what I attack next. I’m soon to get back to work using Hubspot’s awesome inbound marketing software, and I believe that will help launch me to the next level of professional expertise. It seems everyone–and every company, to some degree–is pressing into their social footprint these days. Will the excitement and usage of social media wane in the months or years to come? Probably. But it’s such an integral part of how we communicate so I don’t think it will go away. Maybe it will be repurposed a little as time goes on. For now–it’s here, so let’s use it! One challenge I’m having as an entrepreneur is separating my personal social media activity with my business activity. Experts say I should act ONLY on behalf of my business (ahhh…me and my business are one! ), but honestly, I want to interact with my friends and family (and even some business associates) as Corrie and not SoaringWinds Marketing. It will take some time and more thought before I’m able to juggle both optimally–and I thank my friends and family for tolerating my often-business-centric messaging. So here ends my unstructured ramblings on my social media schooling….there’s a lot more where this came from. Next time, I may have more insightful things to share. Before I sign off, I’ll ask you to check out this cool resource I found for free social media icon sets. 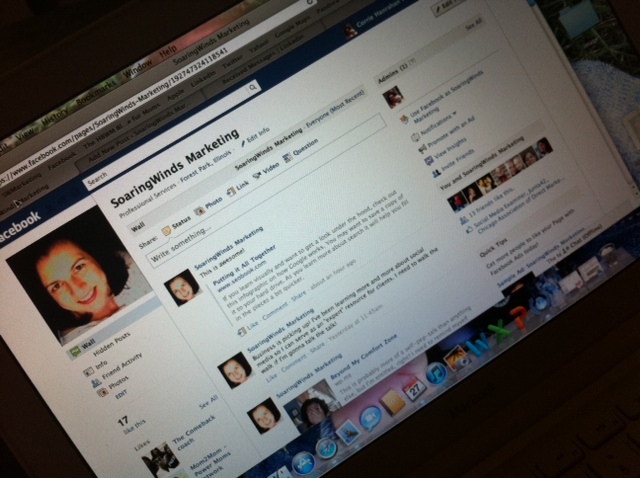 Getting new social media icons on my site may inspire me to write another installment of Becoming a Techie! I would really appreciate it if you’d “Like” my company’s Facebook fan page, because I think it will help both of us. You see, I’ve been spending a lot of my time researching social media and its place in a marketing plan. What I’m learning is that for most companies, social media has to be up-front-and-center with the website, promoting the great things–via sharable content like blog posts and white papers–your clients and prospective clients are looking for. Facebook is doing an excellent job enabling businesses to connect with the people they want to work with, and it’s having way more impact than I thought. Last night I attended a very enlightening social media seminar put on by Joe Cross, CEO of OYM Nation and “The Comeback Coach” (go ahead and check out his Facebook page! ), a man who’s passionate about helping people build their businesses through personal development, practical know-how, and a bit of fun. Joe got me thinking about a lot of things, not the least of which was how I’m using my Facebook business fan page…and how really, Facebook is like the center of the universe. I never really considered Facebook a particularly good place for business because it’s where friends connect. In reality, it’s also where businesses connect–with people. LinkedIn is not the only place to connect for business. Surprise! Pretty much everybody’s clients and prospective clients are doing something online, and it’s likely they’re on Facebook. If not, they’re definitely checking out your website. And in order for them to see your website as relevant (the friendly search engines like Google better think your website is relevant, too! ), you’ve got to provide content that delivers what they want. Whether it’s delivering education, a marketing tip, some insight into overcoming a challenge in your industry, or a pizza (in the case of a pizza place with online ordering), that content better be shareable on the popular social media sites like Facebook, ’cause that’s how new people learn about you. Your website has great things to say, and your fans on the social media sites spread the gospel! So will I drive my personal Facebook friends away from me by sharing my business content with them? Hopefully not, especially if they’re interested in the kind of work I do. Will I attract more business friends who find my content so useful that they want to click on over to my website to learn more about me and vice versa? I sure hope so! Go ahead and “Like” my fan page and enjoy what I have to share. And share things with me! We can all share this great content, share some connections, and hopefully have some fun…er, sharing!